Special thanks to: Andrei Dancau, Svetoslav Enkov, Anatoli Radulov, Yura, Todor Arnaudov and Jordan Iliikov ! There is a featured cover story of the May 1990 issue of the popular Apple II magazine, A+/inCider [AF]. If anyone could send me a scan I would be VERY happy!!! Please contact me if you have any additional information (e.g. pictures / articles), find an error or want to sell/trade/donate a machines to the HCM. According to Jordan Iliikov Just from the beginnings there are jokes about what IMKO means. Eng.Ivan Marangozov is the name of chief of project for adopting Apple II. He work in Institute for technical cybernetics and robotics (wow J ) ITKR short named where first 50 pcs of IMKO was build. So, rumors are that IMKO means – Ivan Marangozov Kopira Originala – Ivan Marangozov Copy Original. The IMKO-1 was a 95% copy of the original Apple-][ without floppy disk drives. It used tape input in a similar way to the early western kitboards such as the KIM -1 from Synertek. The IMKO-1 had expansion slots but then (81-82's) here were not an FDC card in production and no floppy drives also in production. In 1985 in Plovdiv in "Kocho Cvetarov" factory floppy drives manufacturing was started based on some western company but the project failed. According to Jordan Iliikov in fact the project didn't failed. The USA based company bankrupted and former regime in Bulgaria bought all assets including know-how for FDD. Unfortunately, quality of FDD+FDC produced was not good. Also, company IZOT (which is also producer of computers and peripherals) manufactures too FDD for IMKO at Stara Zagora facility. Stara Zagora is mid-sized city located 90 km from Plovdiv in eastern direction. This is the reason that the IMKO-1 does not have floppies - they were simply not available at that time. Some institutes that bought IMKOs and had some foreign currency available those days, was lucky to import floppies from Taiwan (single pieces). The 6502 clone used in IMKO was full with not documented additional machine instructions. These was useful for code protection/ memory savings & etc. According to Jordan Iliikov This not true – Pravetz never been closed city. In fact closed cities doesn’t exist in this time in Bulgaria. There are several “closed” places, like military bases, near government border places & etc. Pravetz is former country village, which is raised to city town because Pravetz was born place for Todor Zhivkov – leader of communist party & head of rebuplic at these times. BTW same is reason for choosing Pravetz for place where computers to be build – as a glory factor for Todor Zhivkov. Pravetz: Правец-8?, -8?, -8?, -8? According to Jordan Iliikov there was a jumper on motherboard which selects which cpu will be used at boot time. It was impossible to switch on-the fly CPU while running code. The RAM is organized 8 x 64kB x 1 (8 chips, 8A too had 8x64Kx1). Both Pravetz-82 and 8M have ROMs with Applesoft Basic (with all features - floating point arithmetic, char and string processing, arrays, color graphics and so on) and a monitor for programming 6502 assembler. 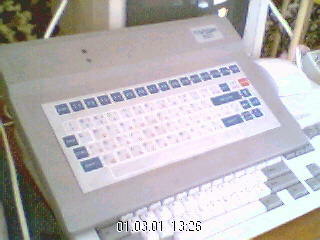 All Pravetz-8x machines operate with the cyrillic and latin alphabet. 8M has 8 jumpers on its mainboard, which allow to switch off/on the CPU Z80, additional 16kB RAM, internal speaker... User also could change the second char table between cyrillic capital and latin small letters. Although 82 and 8M have external floppies, they have output for cassette recorder, too. The Pravetz 8A followed the 8M in 1986. It used CM630/631/633 chipset. That means that it comes with the Bulgarian made CPU CM630. A so-called memory expansion slot was able to host 64k, 128k and 1MB memory cards. (1MB was 8x128k with switching, 128k was 4 x 64k switching and 64k was 4x16k switching spaces via ports ?). As the 6502 only has 64k address space w/o segmentation the 1088k max memory could be used only with a special software, like Apple Works. The RAM switching was done at addresses $D000-$F000 (12k) with 8k fixed at D000- EFFF and 2x4k at F000-FFFF switched. The 1MB card for 8A had too many port arrays and was too hard to program so it was not a real success. The Pravetz 8A has an on-board 80-column card in the CM632 Chipset. This feature had to be achived by a dedicated card with 82/8M. The Pravetz 8A had an extended AppleIIe keyboard with arrow keys. It has 7 slots + one special memory expansion slot. The next Pravetz Computer was the 8E produced in 1987. It was an export version and maybe it was a full APPLE-IIE clone under license (?). According to Jordan Iliikov nobody cared about licenses at these times in Bulgaria – in this time COCOM exist. There is not purchased license for 8E. The 8E was an amazing machine, gray box, and good keyboard - different from usual yellow 82/8M boxes. In 1988 the next generation of Pravetz machines was sold. It was called Pravetz-8C - an improved Pravetz-8A. It differs from 8A because of the missing memory expansion slot. Instead of the expansion slot it had an integrated onboard 64K card. So the Pravetz-8C could be upgraded to a total of 128K on mainboard. There were quite a lot of other on-board components: FDC card, Printer card, RS-232 card, RGB-out card and 80-column card (as in 8A within the CM632). These additional cards were not integrated as a dedicated chipset, but in a way as if standalone cards were inserted into slots but mounted onboard. This causes the 8C to have only 3 expansion slots instead of 82/8M's 8 slots. This integration was possible due to improved printed circuit design. On 8A board there was a lot of wasted space. 8C board is too dense (more density of chips). The 8C was sold for 1430+ levas in 1989! For this price it included a monitor, cpu and one floppy drive. The 8C case is comparable to Apple-IIE case. The Pravetz-8D was positioned as a real HOME computer - priced at 450 levas (year 1989 prices). It did not require a monitor but hooks up to a TV. RGB monitor and printer could also be used. There was no disk drive available so a tape recorder had to be used. To a certain degree this machine is said to be compatible with the ORIC Atmos [ORIC FAQ]. have full b/w-screen and not cassetofone/rs-232-c!!! "The style of the system software was intentionally directed to what is known as PC-DOS (and run on IBM-PC machines and compatibles). The benefits of such approach is the considerable reduce of time necessary to start over (in case of such experience). This approach was observed also in many technical decisions. One of the great advantages is the physical and logical 100 % compatibility of floppy disks of Pyldin and IBM-PC compatible machines. Thus you can read and write diskettes with Pyldin and/or with other machine. So you can say that Pyldin is file-compatible with an IBM-PC." The UniDOS commands are very similar to PC-DOS ones, with very exceptions they may be considered a subset of PC-DOS. The Text editor is similar in concept to editors like Word and Word-Perfect or the PE2. Two other products – UniPASCAL and UniBASIC are also similar to the corresponding products found for IBM- PCs. " some more infos can be found [here] and [here] but I can't read it.